NRDIS, Styled with a nod to Georgian Revival with door bays decorated with very elaborate neoclassical facades. Reinforced concrete throughout with a brick and limestone facing, consistent with the "Colonial Revival" architecture of the Village. Themes - Architectural, Commerce, Community Development, Industry & Transportation. 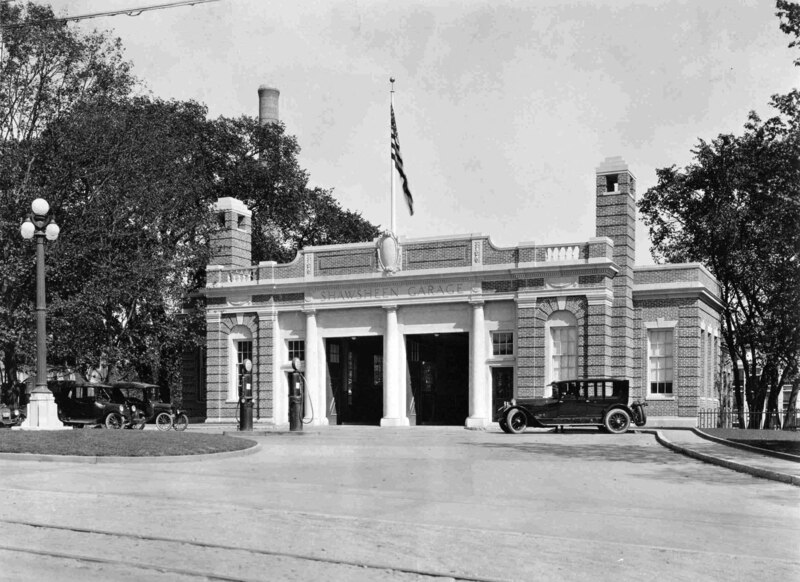 The Shawsheen Garage was built as part of the Shawsheen Village development, 1918 - 1924, by William M. Wood, President of the American Woolen Company. Wood hired about eight different architects to design the homes and structures for the village. 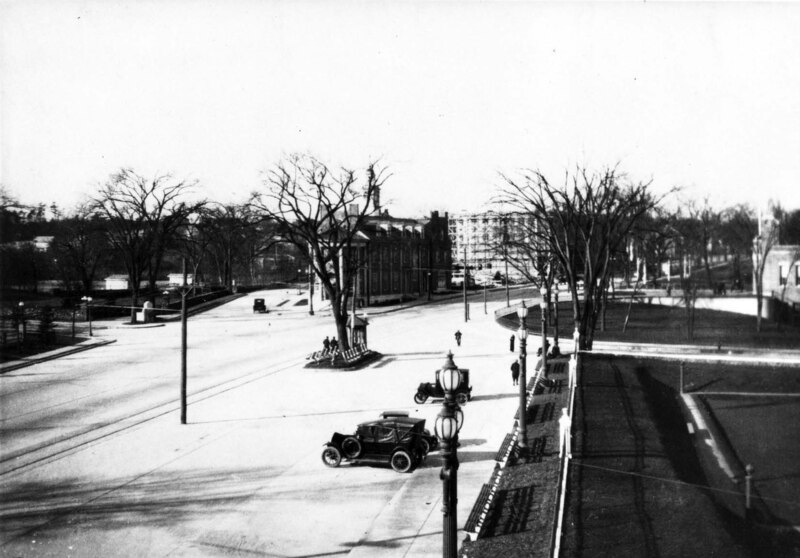 Adden and Parker of Boston were the architects, and also designed the Post Office building across the street, the Balmoal Spa building and the Administration Office Building for American Woolen Company, (now Balmoral Condominiums). This garage was used for parking cars or "live storage" and primarily as a full service mechanical facility. The building was opened in 1921 and by 1922 it was necessary to construct the second garage on Haverhill Street. William Madison Wood, the "dreamer" of Shawsheen Village, considered individual garages unaesthetic, so Shawsheen residents were required to park in the common garage. This first garage, which also included a repair shop and was quickly outgrown. Andover Townsman - July 22, 1921 p. 8 - "Shawsheen Garage - Nothing Has Been Spared to Make It a Completely Equipped Service Station - Employing a force of eighteen men, with a car storage capacity and gas and oil storage capacity equaled by few garages in the state, and with a machine shop and repair shop which boasts equipment complete enough to do anything to any car, the Shawsheen Garage can well lay claim to being amoung the best, if not the best garage in the state. Certainly nothing has been spared to equip it fully in every detail and to make it a complete unit as far as garage repair is concerned. With underground tanks on both the first and second floor, the garage is capable of storing a maximum of 3500 gallons of gasoline at one time. Eight Bowser hydraulic pressure oil thanks, store a total of 800 gallons of oil. It is impossible to judge the size of the garage from the street floor on Main street. While the upper floor has a capacity for car storage of fifty cars, the lower florr with an entrance from Haverhill Street, stores more than sixty and may even take a few more in the machine shop. All permanent berths on both floors are taken at the present time. Everything has been done on the upper floor for the convenience of the touring motorist. Does he desire gas, an air-pressure tank will furnish him with five gallons in ninety seconds and he need not enter the garage and go to the trouble of backing out again. If he desires repair work done, he but drives his car into the garage and while the work is going on, his wife or other women guests may enjoy the ladies' rest room. Most certainly a garage is something different from others if it provides a blue and gold, wicker-furnished rest room for its lady patrons, furnishes reading matter, and even the necessary accoutrements for a short game of bridge, if the repairs are longer than usual. No other garage in the country has such an efficient system of air for tires. A compressor on the lower florr which automatically keeps air pressure above 135 pounds and below 190, furnishes air to a stopcock on every cement column in the garage, upstairs or down. No maneuvering or hauling of a tank on wheels is necessary. A peculiar feature of the system is the attachment which allows the use of the air to spray gasoline or kerosene when cleaning parts of the car or engine, and also to spray polish when shining is to be done. The nozzle has a very delicate adjustment and a trigger action which makes its use extremely simple. The repair shop, under the direction of Carl M. Peterson, is said to be the finest and best-equipped repair shop in the country. The shop is fitted out to do repair work and machine shop work of all kinds. It has a traveling crane with 20-ton capacity that lifts up a motor truck like an infant in arms. It has a two and one-ton trip hammer, a moving hoist for motors and another for truck and pleasure car bodies, several power lathes with all attachments necessary for grinding and reseating valves, etc., it has a 20-ton press which is used only for putting solid rubber tires on heavy trucks; in short, there is nothing much which a first class machine shop should have, which this one has not. The garage building itself is 150 feet long and eighty feet wide in addition to the back ell containing the machine shop, which is about thirty-five feet by eighty feet. It is built throughout of reinforced concreted and sis made especially suitable for garage purposes through the use of steel-silled windows which afford an abundance of daylight throughout the garage. Plans were drawn by Adden & Parker of Boston. Carl M. Stevens is in general charge of the establishment." The property was first leased then sold to Claude P. Woodworth, agent for the Jenny Manufacturing Co. on August 3, 1936. Jenny Manufacturing Co. then owned and operated the garage from 1936 to 1960. The gas and oil sold was Jenny. The property was then purchased by Claude P. Woodworth on Nov. 1, 1960. Woodworth expanded the business into automobile sales of Chevrolet and Cadillac with a new show room built on the corner park between the Shawsheen Garage and the former Shawsheen Laundry on Haverhill Street. The new structure was not without controversy as many residents in the Village felt the building did not fit into the style or design of the Village. Woodworth owned for 18 years making use of every piece of the property for service and retail. Woodworth family sold to William P. & Kathleen M. DeLuca, Jr. on May 16, 1978.